WOW! Thank you Brittanie for writing me a review. 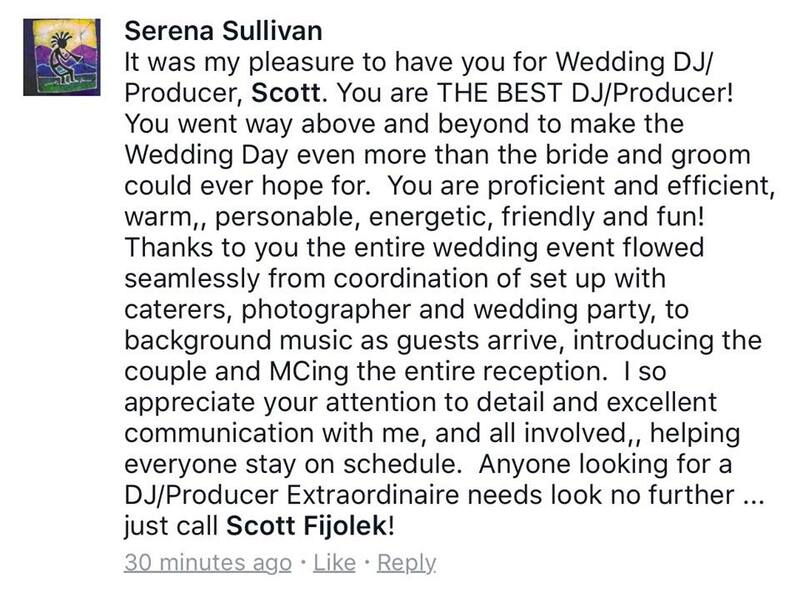 (Especially from the perspective of a wedding photographer and someone who did not have me as their wedding DJ.) My heart is overflowing with gratitude because of your review and the kind words you said about me and my service. We have worked with each other at weddings a few times now and you are truly a COMPLETE joy to work with. If anyone needs a wedding photographer, here is Brittanie’s contact info (www.pnwreflections.com) 360-584-6173 (PNW Reflections) I HIGHLY RECOMMEND Brittanie White. Thank You Rev. Serena for your VERY thoughtful review!! It was a HUGE Blessing being able to work with you at Jeff & Constance’s wedding. (If anyone needs an Awesome Wedding Officiant, contact Rev. Serena Sullivan: 206-604-7732 or Email: revssathome@comcast.net) Rev. Serena is A-M-A-Z-I-N-G!! 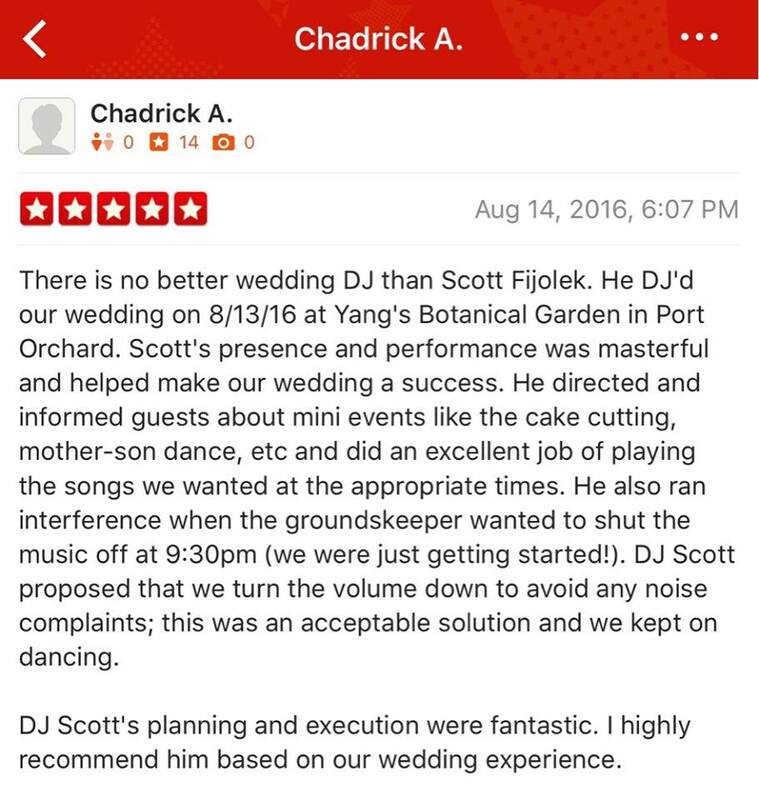 Thank you Chad for your review! 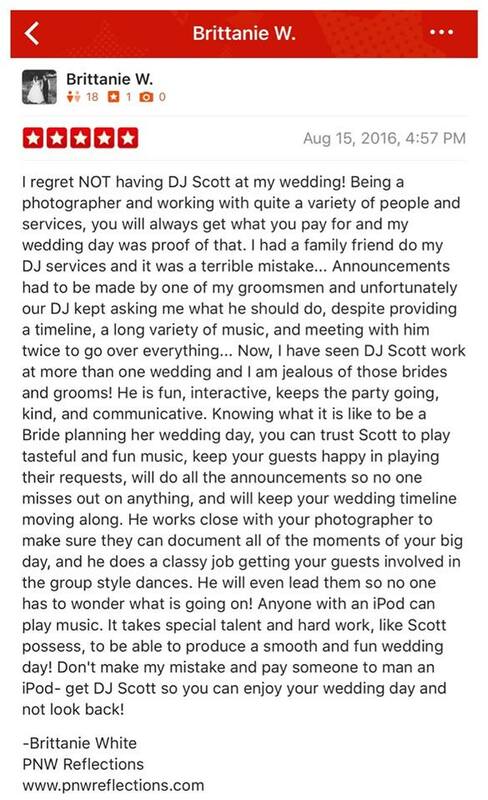 I LOVED being the Wedding Producer / DJ for your wedding with Leslie (She is by far THE BEST!) I also Loved meeting your friends and family!! They are Amazing and FUN! The Flash Mob was PERFECT! Yang’s Botanical Garden was a “Georgeous” venue to have your wedding at!! (Mr. Yang: 360-871-3555) www.yangsgardens.com (yangsweddings@gmail.com) The botanical garden was Breathtaking! (Despite the hiccup we had with their timing mistake, but we were able to turn a negative into a positive!!) Wedding Officiant Rev. Tim Phillips was WONDERFUL. I LOVED the way he personalized & customized his ceremony to you and Leslie. (Rev. 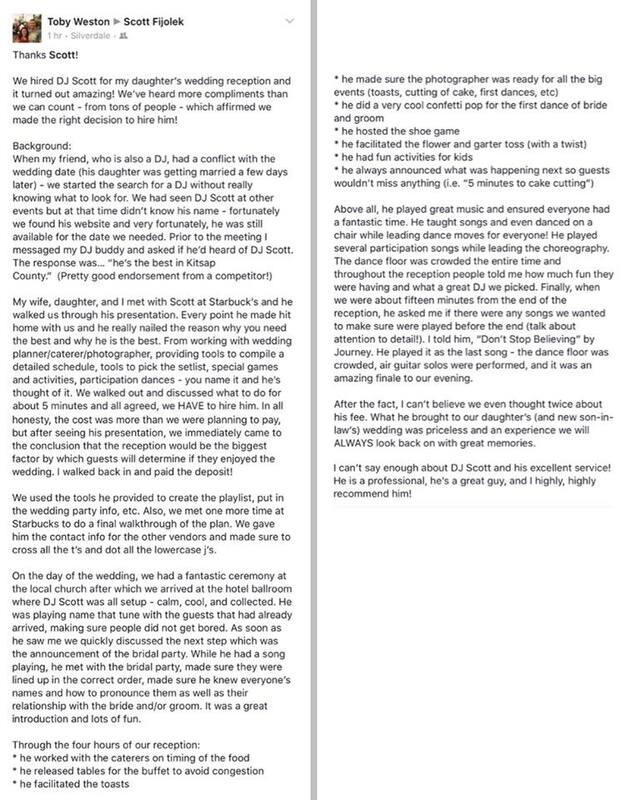 Tim: 206-325-6051 x104 Email: Tim@seattlefirstbaptist.org) “Especially the Gift he gave to you and Leslie that had to do with your Wedding metaphor (then my little added touch with the song he spoke about: “You make me feel like dancing”) Brank’s BBQ & Catering (BranksBBQ.com / Phone: 253-891-1789 ) provided a delicious meal for the guests. Your wedding photographer is one of my FAVORITE photographers of ALL TIME!!! (Mary Eklund of Four Feet Photography : 360-551-2923, email info@FourFootPhotography.com, Website: FourFootPhotography) I also loved meeting and working with your Videographer: Julian Beltran! He did a phenomenal job capturing all the fun memories on video!